Parrot… A bird, as if created to please the eye, to amuse and entertain the onlooker with the imitation of human speech, an overseas miracle. And how shocking the image of a dead parrot, and even more than one! It was on this Paul Gauguin decided in one of the still lifes of the Polynesian period of creativity. Bright colors can dazzle your eyes for a moment, but when you look closely you will involuntarily shudder. Three dead parrots lie on the table. Their bright, colorful plumage disharmonizes with the immobility, stiffness of the dead birds. Next to them, with a careless hand, a brush of red berries is thrown – as if of a Russian rowan or Kalina, though, of course, this is excluded. At the very edge of the table, also like to enhance the contrast of perception, rests an exotic, yellow-red flower. Another flower is embroidered on a tablecloth, which is covered with a table. On the side and to the right is a dish, covered with a lid, and that there, under it, one can only guess. And in the center there is a certain altar, a sanctuary in the form of a female figure sitting in a lotus pose. It is very possible that the unfortunate birds were sacrificed to this Papuan deity. Gauguin did not forget to attribute the picture, indicating to himself on the lower left, and the year 1908. 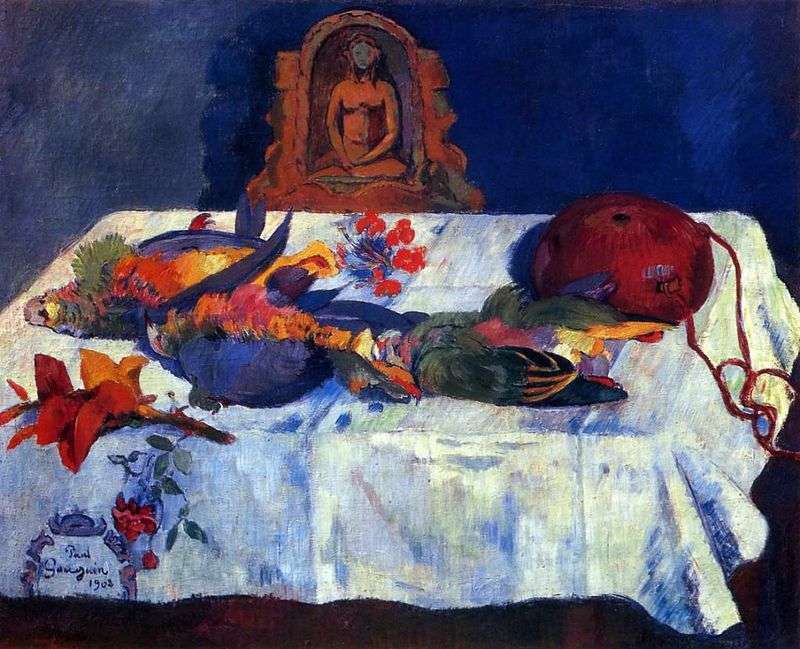 Description and meaning of the painting Still Life with Parrots by Paul Gauguin.